It should not be a surprise if I say that our state of mind affects our health; and many experts believe that too. Of course, there are many other physical reasons that one suffers from certain sickness and his/her emotion is just one of many possible factors. The fact is that when a person falls sick, there are many hidden messages that his/her body wants to convey to the person. So, it is worthwhile to be attentive and listen to what a person’s body has to say to him/her. When a person feels he/she is being harmed by something and that he/she wanted to remove the problem eagerly. When a person has a wish that is yet to fulfil hence he/she felt agitated and sorrow. He/she would be in extreme pain and that there is no more love and kindness in this life. The person is deeply hurt inside and helpless for a prolonged of time. The person is in fear and he/she refuses to accept realities in his/her daily life. The person tried to control his/her anger and hides his/her vengeful mind. The person is in anger and he/she puts blames on others; and that he/she is arrogant. The person like to control others hence he/she is always in anger and anxious if others refuse to follow his/her will. The person is in prolonged unsettled anger. While it is true that when our body falls sick, then the best approach is to seek the help of modern medicine first; and at the same time understand what our body tells us. It is only when we tackle our sicknesses mentally and physically that our quality of life improves. It is certainly true that not all physical sickness can be cured; but at least they can be put under control for a fairly long time. This story is told by my Taoist brother who now resides in Jiayi (嘉义), Taiwan. The story happened in Xinzhuang (新庄) of Jiayi County many years ago many years ago where a very rich man who bought 13 young maids to help him managing his domestic affairs. This person somehow was said of raped and killed all of his 13 maids at the end. The bodies of these unfortunate 13 maids were subsequently buried on the peak of a small hill nearby. The story of 13 maids was popular within the locals ever since and it is still a hot topic after the formation of new Taiwan. It was said that starting somewhere from 1911 onwards, thick fog and mist always developed during gloomy days that would cover the whole hill for days. The local believed that these phenomena were caused by the restless spirits of the 13 maids because they felt lonely and no one noticed and made offerings to them. At times, sorrowful weeping sounds could be heard came out from the fog. The Xinzhuang village was a very small village with not more than 100 residents. Though a small village, three of the villagers lost their lives to the spirits of 13 maids; at least the locals believed to be so. The first casualty was a farmer of around 50 odd years old. He had a duck farm situated just beside the river that runs at the foothill with 1,000 egg laying ducks. This farmer built a small hut at the hill top so that he could rest and overseeing his ducks. One evening, three of the maid spirits appeared in front of the farmer requesting food offerings. Due to extreme fear, the farmer started to run down the hill but the persistent spirits again materialized in front of the framer and warned him that if he ignored their request; he has a choice of either he or his ducks will perish soon. This stubborn farmer again ignored the request of the spirit and 5 days later after this farmer returned from his duck farm, just as he was stepping into his house; he suddenly dropped dead on the door brim of his house. One year later, another farmer installed a water pump beside the river to pump up river water for irrigation purposes. Again, the 13 maid spirits materialized in front of this farmer warned him that his pump was making too much noise that has disturbed the spirits from resting; he should stop his operation immediately. This farmer also ignored the spirits’ request and continued to operate his pump. On the 5th day, this farmer was hag-ridden during his afternoon nap in his pump room by the 13 spirits. He was scared as his predecessor and ran back to his house. After the incident, this farmer switched his operation to the morning as he thought the spirits would not disturb him during the morning hours. Just as he thought his ordeal was over, during one of his pump maintenance session; the pump belt suddenly snapped and the belt stroke the farmer’s face and he was knocked unconscious. Unfortunately speaking, the unconscious body of the farmer fell facedown into a small pond and drowned by just 3 inches of water. This ill-fated farmer was only 39 years old when he met his doomed. Two very close cowboys used to let their cattle graze on the slope of the small hill. They have not had any big fights since they knew each other… well, not until the said 13 spirits appeared in front of them asking for food offerings. Both of the cowboys were thought young men and they too refused to satisfy the sprits. A few days later, a fight suddenly broke out between the two cowboys for a very small reason. Not long after that, one strong bull ran amok and rammed head on into one cowboy and he died of severe injury. A week later, the other cowboy committed suicide by drinking insecticide on the hill slope because he was jilted by his girlfriend who scorned at his appearance and handicapped. It was said that no one dares to approach the said small hill since. Perhaps the 13 spirits had gone by now but my Taoist bro had not had another chance to revisit the place again. So, I would just stop the story here for now. I am often being asked to evaluate if a house or a premise is haunted. If so, then I am required to perform space cleaning before the actual construction work is being carried out. On the other hand, I am also being called in when there are just too many incidents happened in a premise during the actual construction phases. Hence I have developed some small games to provoke spirits bounded to a place or otherwise they would stay dormant unnoticed during the course of investigation. These small tricks can also be tried for those friends who like to do ghost hunting activities. Those tricks can be used in conjunction with modern electronic gadgets such as motion detectors, cameras, or EMF detectors etc. However, I don’t use any of the modern gadgets as I found them quite misleading for our human senses are still our best tools. So, what to look for in an old abandoned house which would give us some tell-tale signs that there are restless spirits hiding within? Before we go into an old abandoned house, safety is always the main priority. It is always a risk to enter an old building during strong wind or a heavy down pour; or after a strong wind or rain. It is a norm that the roof tiles may fall, an old door or even wall may collapse due to rain, wind or even minor earthquake. Not all fallen objects are caused by ghosts… One should also be wary of decaying wooden structures such as staircases, house beams, wooden floor etc. It is best to enter an old building with a group of people or keep your family and friends informed of your whereabouts. Do remember that ghosts don’t kill, humans do. Please do not fall prey to robbers when you are having fun. In an Asian house, it is a norm to find an abandoned altar with soul tablets and incense burners. So, if you like to awake the spirits of the place; then burn some incense in the burner and the spirits will come. If there is no altar of any kind, then look for any mirrors. It is best to find a big old makeup table with a mirror attached. If you are not too afraid, then just stand or sit in front of the mirror and look into it. Soon you will be able to see some kind of foggy things in the mirror. For best result, then you may get a comb and slowly comb your hair while looking into the mirror. Experience has shown that combing of hair in front of an old mirror could somehow attract spirits of previous owners, if they have chosen to stay put. These spirits would feel uncomfortable if you touch their personal belongings and they will make some commotion to attract your attentions. Another item for the investigator to look for is an old armchair or any chair that is available inside the house. If you found a chair, then just sit in the chair and close your eyes and listen to your environment. You will definitely hear sort of high pitch noise near your ear, or a scent of perfume etc. if and only if spirits are present. There would be environmental temperature changes: if you feel cold, then the spirits are not that harmful. However, be careful if the environmental temperature suddenly becomes hot. Also if there are toys or personal items lying around, then you may also pick them up and use them to attract spirits too. A very good and quick way to stir up the emotion of spirits in a house is to rearrange or break items in that house; if you dare of course. There are many people yelling and shouting to insult spirits but those actions rarely attract attentions and reaction of those earthbound spirits. The best way is just to break a mirror, or to move a chair from one corner to another. The best time to perform the provocation is at dawn or at dusk as spirits are most active during these two periods of the day. Just as our human world, spirits start to get active at dusk and passive during dawn; which is just opposite to human world. However, there will be exceptions pending on what type of entities are in the house. Demonic entities can be active during any time of the day and they are more aggressive than ghosts. Lastly, you should only try the above tricks only if you are willing to take risks and you should be responsible on your own actions. My friend Mr. Saw used to own a garment factory in Ipoh before it went down in blaze some years ago. There were a few sections in his factory and the sewing department is just one of his many departments. There used to be about 50 sewing machines in Saw’s factory and one of them is believed to be haunted by the restless spirit of a lady operator known as Siew Mei. As far as I know, Siew Mei was a single mother with two children who died in a freak accident on her way back after doing overtime work. It was a rainy night Siew Mei was on her bicycle holding a large umbrella. Perhaps she lost balance due to strong wind and she fell onto the road and a lorry ran over this unfortunate lady. The incident happened one week before payday. At that time, factory workers of small factories were still being paid with cash instead of directly crediting into the person’s account. So, on the payday; the payroll clerk as usual put the money of each worker into an envelope and habitually walk from one end of rows of sewing machines to the other until everyone is paid up. When the clerk walked passed Siew Mei’s sewing machine, she habitually put the envelope filled with money beside the machine and asked for a signature. Of course, at that time the payroll lady didn’t really raise her head to look at everyone at the sewing machine… she just walked passed one machine and made a rollcall. She would only lift her head if there was no answer from the sewing machine. As recalled by the payroll lady later, she thought she heard the familiar voice of Siew Mei responded to her when she passed Siew Mei her hard earn money. At least the clerk thought the sewing machine was running and that ‘someone’ was sitting behind the sewing machine. But only after the payroll lady walked a few steps from Siew Mei’s place, she suddenly realized that she only attended Siew Mei’s funeral a few days ago and who was working on Siew Mei’s machine? Strange enough though, the money was lying on the sewing machine intact. There was no one at Siew Mei’s machine. The clerk asked Siew Mei’s fellow workers and they unanimously said that no one was working at Siew Mei’s machine at that time. But interestingly speaking, when the clerk looked at the signature on her receipt; true enough! It was indeed the signature of Siew Mei herself! Since then, the sewing machine was said to be haunted and night watchmen even claimed to have heard and seen this specific sewing machine operated by itself at night though no one was seen near the machine. My college mate, Joanna wanted to find a part time job so I introduced her to work for three months with Mr. Saw. It happened that Joanna was assigned to the sewing department to take over the place vacated by Siew Mei. At first I thought I have made a mistake as there were about 10 rows of sewing machines. So I turned my head and looked for the shift supervisor. Perhaps I just saw Siew Mei’s ghost, or perhaps it was just my hallucination as I was fairly tired at that time. A few weeks after Chinese New Year, Mr. Saw’s factory caught fire and burnt to ground. Many people said it was the work of Siew Mei as she wanted to keep the sewing machine for herself for all eternity because she felt her job was threatened. However, there is no conclusive answer as of today. 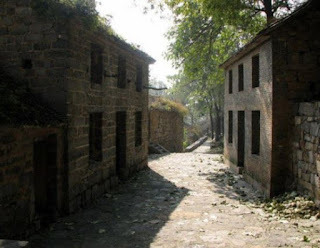 The Fengmen Village (封门村) is located in Henan Province (河南省). This village is abandoned since 2007 but somehow rumours of the village to be haunted started to spread in intranet starting 2008. Gradually, the Fengmen Village became a ‘ghost village’ somehow… but after some investigations performed by Henan TV, the village is indeed not haunted. A Chinese friend of mine now in his 70s has visited the Fengmen Village in 1963 with two of his friends did encounter some ghostly apparitions. In fact, the Fengmen Village was only vacated after 1981 after a government enforced mass transfer. Back to the story proper, in 1963, my friend Lee and his two friends came to Fengmen Village to do sketching and oil painting. The reason they visited the village is because of its special building structures and scenery. The day the three pals entered the village, coincidentally speaking; a household of three suddenly died of high fever and they were just in time for the funeral ceremony of the unfortunate family. It was a custom of the village to throw the pillows of the deceased villagers onto the middle of the front road. Unfortunately speaking, Lee and his pals thought the pillows were blocking their way; so they kicked the pillows aside… Little had they know that this was the beginning of their nightmare during their stay in the village. After the three companions has entered the Fengmen Village, they visited the headman so as to find a dwelling place as there were no hotels in the village. Since there was just an empty house left over by the deceased family, the headman asked the 3 fellows to stay in the vacated house. Even though the 3 of them were afraid and somehow reluctant to stay in a house of the recently deceased, no one dares to open his mouth for the fear of giving trouble to the headman; and they didn’t want to insist. First, the three of them always hear children shouting for mother… when they ventured out, they could not find anyone in the house vicinity. Luckily speaking, the other friend heard the commotion and managed to knock the person out cold. After the incident, the three pals finally came to consenses that there were some evil entities in the house. So, they quickly visited the village headman and after listening to their ordeals, the headman brought them to the graves of the house owner to perform prayer. Soon after the prayer, three of them had recovered from their fever and they had not had any bad dreams for the duration of their stay. After returning from their trip, Lee concluded that although the family of three had died, their bodies were buried nearby their house. Perhaps it was that the restless souls of the deceased wanted to return home as it was the village custom that even the dead are buried within the compound of the village; thus making the livings live amongst the spirits possible. It was perhaps that the roads within the Fengmen Village was so entangled that the spirits of the dead were trapped within the maze like village for ever. Further, there was no Buddha statue or Taoist statue in the village to overpower those wandering spirits. Whatever case that might be, Fengmen Village may become the thing of the past as I heard that the government planned to build a dam nearby soon. This game should ideally be played in a cemetery at night after 9pm; and this is a single person game. You will only need a red cloak, cap, a small basket with some foods, a piece of red string and a red umbrella. The player then stares at the child’s tomb stone and say gently: “Come!” He/she can stand silently in front of the tomb for a short while pending on how much time the player has. The more sensitive player may be able to see black shadows or develops goose bumps, some even feel dizzy or headache. If the feeling is overwhelming, then the player should stop the game immediately. Otherwise, this player should proceed to the next kid’s tomb stone and repeat the above process… until this player has inspected all kids’ tomb stones in the graveyard. After that, this player must return to his/her starting point and lays the foods he/she has prepared on a suitable location where he/she can meditate for further spirit communication exercises. As soon as the foods are offered to the spirits, this player should prop up the red umbrella over the food offerings. Then, he/she should tie one end of the red string to the umbrella and the other end of the string should be tied on the person’s ring finger. When this is done, the player can sit down and feel what the spirits have to say. There could be just one spirit or more, there should be a strong presence. When the player has had enough, he/she should just remove the red string on his finger and ties it on to the nearest object. This should officially end the game. The danger of this game is the player may not be able to snap out from the trance when the spirit that comes is very powerful. So while it is a must to walk through the grave alone, it is best to have a few persons to supervise this player at the starting point. Finally, just a word of warning… unless you can find some masters to help you; don’t try it alone! There are physical and spiritual dangers in the cemetery at night. In Taoist ritual, both soul banner (招魂幡) and umbrella can be used to summon a lost soul. The difference is that conjuration with a soul banner is a more formal way to call up a lost soul and it is used by orthodox Taoist mainly for deliverance services. Many Chinese believe if a person died outside of his/her house due to accident, then his/her soul must be summoned using a soul banner together with his/her worn clothing or the person’s soul may become wandering spirit and haunts the place where he/she meets his/her doom. First, a person need to buy or make 8 numbers of umbrellas of any sizes and arranged as shown above. He/she also need to gather some joss paper (溪钱) for opening the portal to the spiritual realm; and of course the standard incense, candles, food offerings etc. At the place of interest, the umbrellas are opened up and propped up as shown and the person should stand in the centre holding some joss papers. When the time is right, the person must stand in the centre of the umbrella array holding some joss papers. He/she should first walk to the east and throw some joss papers into the air and shouts: “I am opening the spiritual gate towards the east!” After that the person should take an about turn and return to the centre. He/she should do the same with the south, west and north. When all of the four directions are done, the sorcerer should sit in the centre and pay attention to the umbrellas. After a while, if the spirits give reactions to the summoning; then one or more of the umbrellas will move or topple. At this point, this ritual is considered to be successful. The sorcerer should quickly walk in a counter clockwise direction starting from the south to collect the fallen umbrella(s) and close it. The sorcerer must walk a full circle and then take the nearest exit made by the toppled umbrella. It is believed that one or more souls are trapped in the umbrella(s), at this point the person can bring the umbrella back for further ritual, or throw it into the river to get rid of the spirits. However, if this umbrella ritual is used to catch the soul of an enemy, then it is sufficed just to face the direction of the person’s house using one umbrella. Lastly, only try this ritual if you think you can handle the spirits please.